The mountains and the sea represent not only the main geographic features of Rethymnon prefecture, but also serve as its main tourist attractions. Most visitors begin their adventure at the prefecture's eponymous capital city, known worldwide for its old Venetian quarter, a compact neighborhood dominated by a huge medieval castle. Although this city gets very crowded at the peak of tourist season, you can always escape its hustle and bustle by venturing deeper into the mountainous countryside. The prefecture's less-frequented inland areas feature olive groves, steep gorges, and tiny hamlets, good bases for exploring the island's sandy southern coastline. Rethymnon Prefecture is in Crete. 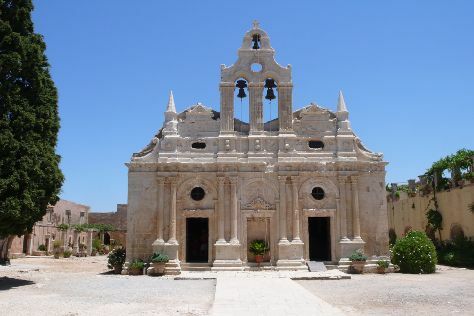 Use our Greece online tour itinerary planner to arrange the hows, wheres, and whens of your trip to Rethymnon Prefecture.